On Thursday morning’s news, it emerged that protesters from Greenpeace had targeted Didcot power station in an attempt to shut down the coal-fired plant. Some of them chained themselves to a conveyor belt carrying coal into the station, while others headed for the top of the 198-metre high chimney. By abseiling from the top of the chimney, the protesters were able to paint the message “Blair’s legacy” down the side, as can seen in the image. 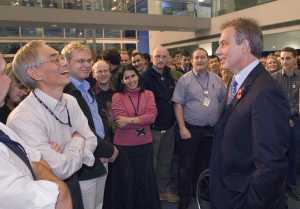 As it happened, Tony Blair was in the area that day to visit the Diamond synchrotron. On Greenpeace’s website it said he was in the area “coincidentally”. But you do have to wonder if they had inside information. Greenpeace claim that Didcot power station is the second most polluting in the UK, and that two thirds of the energy is wasted as heat from the cooling towers. Their idea of localised generation where homes can be heated using the excess two thirds is reasonable, but this wasn’t really emphasised in any of the reports in the media – the nature of the protest overshadowed the most important part of their message. And as the Prime Minister said on the special local news programme that evening, he couldn’t just shut down the coal-firied power stations overnight, and any savings in CO2 emissions would soon be wiped out by growth in the developing world. Those countries need to be brought on board if we are to fight climate change, and they aren’t going to stop building polluting power stations just because we’ve closed ours. The following day, the power station’s owners, npower, were granted a High Court injunction, ordering Greenpeace to leave. The protesters were swiftly arrested on suspicion of aggravated trespass and criminal damage, although thanks to health and safety rules, it seems unlikely their punishment will be to clean up their graffiti. What if the Greenpeace works here!